View More In Pendants, Drops & Finials - Page 8. 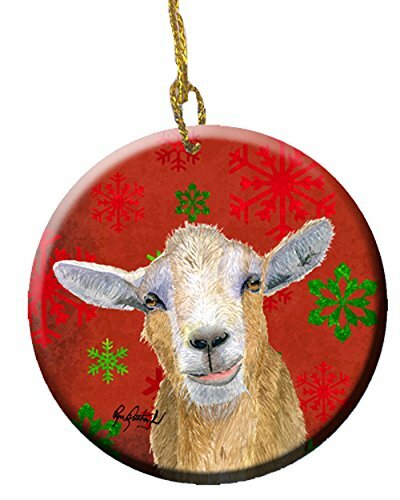 This gloss white ceramic ornament is great for Christmas. Included is a small gold cord for hanging. The back of the ornament is white and can be personalized by you with a paint pen or a permanent marker. This is a gloss surface so make sure that you allow any personalization to dry well before you test the area. Personalize with a date the year a message to a friend or even the pets name. A great holiday present or an heirloom gift item.Features. diameter - 2.8125 in.. material - porcelain. Shape - round. Dimension - 2.81 x 0.15 x 2.81 in.. item weight - 0.3 lbs. If you have any questions about this product by Caroline's Treasures, contact us by completing and submitting the form below. If you are looking for a specif part number, please include it with your message.